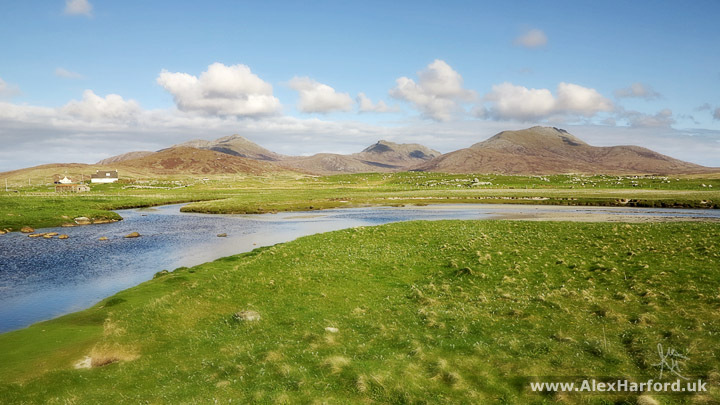 The Outer Hebrides are stunning. I was amazed at the diversity of the terrain - each of the main islands (and many of the smaller ones) has it's own character, and I visited numerous places that are as beautiful or spectacular as anywhere I've been. 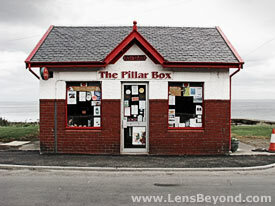 I expected the Outer Hebrides to be beautiful, but my expectations were surpassed. It's a wonderful place for photography. My trip took much longer than I thought it would, as I found so much to do while passing through (and so much I missed I can return to). If you're wondering where to visit, I'm sure you'll be inspired by some of my highlights. 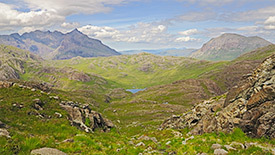 They include favourite walks, historic buildings, campsites, art galleries and wildlife. I love the outdoors and walking is often the best way to get to know a place, whether it's a city or the countryside. There are some amazingly scenic drives in the Outer Hebrides, and I had great fun cycling (with no back brake for most of the trip, until I got it fixed in Stornoway in the north). But you're sealed off from everything in a car, and pass by too fast. Usually cycling is my favourite way to see places, but some of the walks I did were so fantastic, walking pace was the only way to take it all in. I expected walking to be a highlight (it's one of the main reasons I travelled to The Hebrides), but I didn't expect such a walkers paradise. One day I could be walking in challenging, varied terrain, with ever-changing scenery and spectacular views, and another I could be taking the most relaxing stroll ever, along white sandy beaches with warm blue skies; the smell of wildflowers on the gentle breeze and bird-life everywhere. 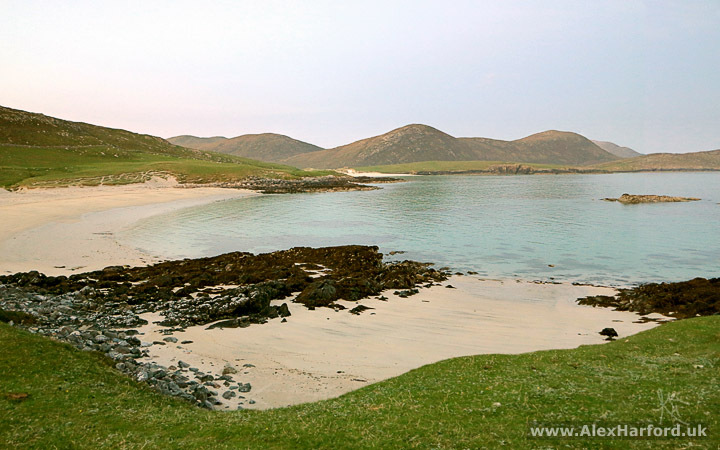 Or both in one day with the numerous beautiful beaches backed by hills and mountains, particularly in Harris. If it went completely dark, I didn't see it (I was in the Outer Hebrides from mid-May until early-July - usually asleep before 1am). So as long as I carried a tent and enough food, I didn't worry about finishing a walk at any particular time, or even worry about returning late if I didn't take a tent or bivvy. Sometimes I found myself walking to just another beach, or just over another hill, until close to midnight, without my tent. It made me tired and 11:30pm became an early night for sleep, but it was a joy to be in such peaceful places so late at night. The lack of true darkness was a slight disappointment however, as with the almost complete lack of light pollution, I was looking forward to some starscapes. As well as plenty of wild camping spots, there are excellent campsites evenly spread throughout the islands. 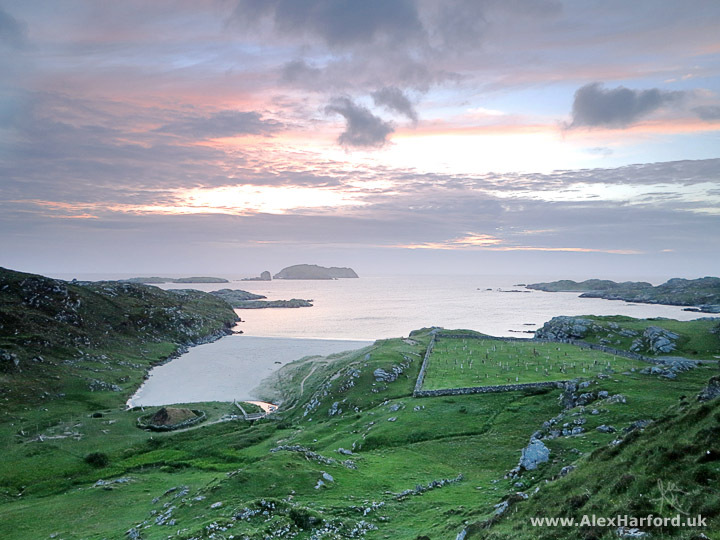 My favourite was the campsite at Borve on the Isle of Barra, which claims to be the furthest west campsite in Britain. 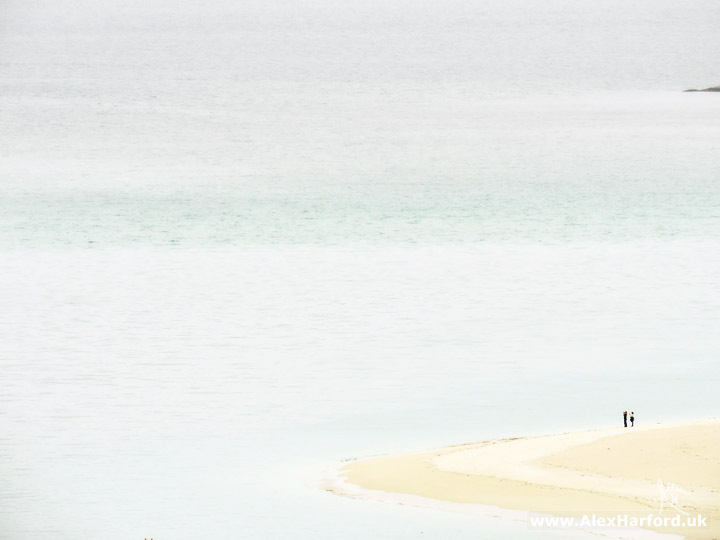 So many places seem untouched by humans, and the islands are so peaceful. 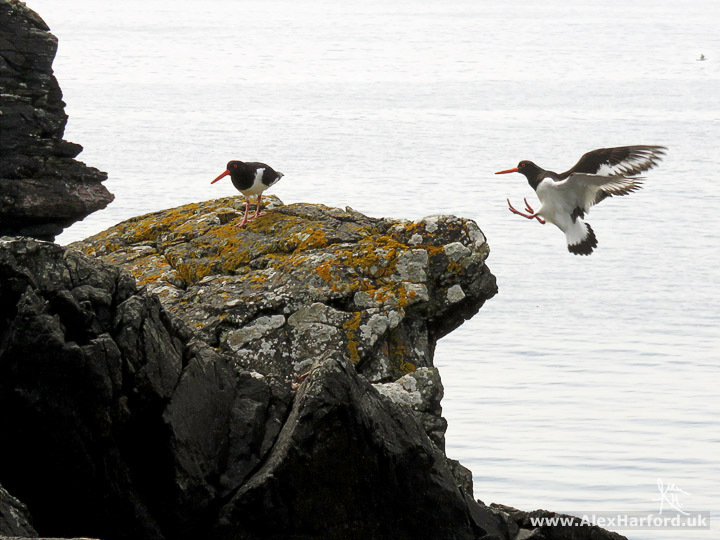 Just don't sit in an oystercatcher's territory - you'll know if they start meep meeping while flying around you in circles. 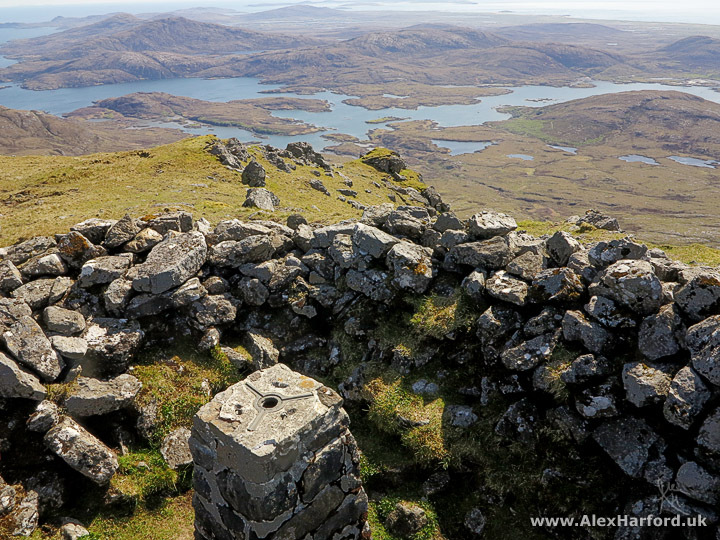 Although I walked to the highest summits on most of the islands (I failed to scale the lowest of them all - that's a story for another time), there are loads of small hills with great views too. All of this, and I haven't mentioned I often went more than a day without seeing a single person. When I did see other people, whether it was a local or fellow traveller, we'd often stop to chat. 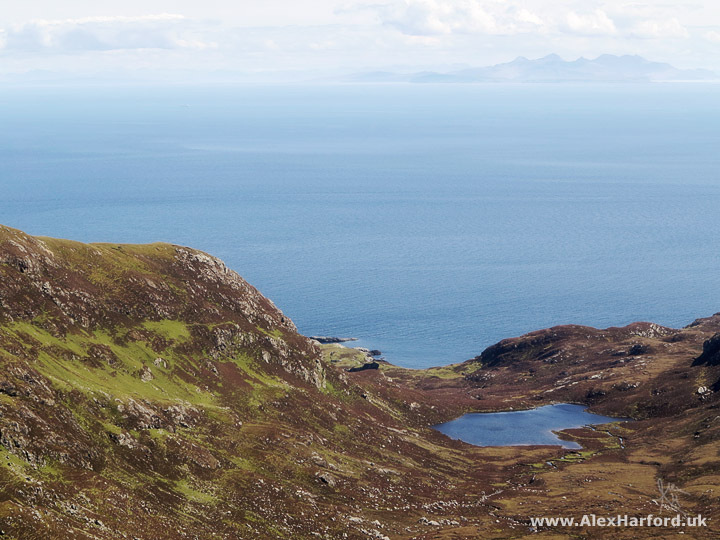 I probably met more German people than any nationality outside of Scottish, lots of geologists, and even a German geologist at the top of a mountain - the only person I saw on that mountain (though that was the Isle of Rum, so not The Outer Hebrides). There must be a downside to all this walking outdoors? It's Scotland. How about the midges and bogs and tics and terrible weather? Midges only bothered me twice, and only briefly as I started walking again (they can't keep up - I've no idea where they appear from when you stop), and there was usually enough of a breeze to keep them away. I only had to remove 3 tics on the whole trip, and that was when I wore a short-sleeved shirt. Covering up seemed to do the job. I was lucky with the weather - I heard one local on the Isle of Berneray say it was the driest spell for over 10 years. It was dry for so long that even large stretches of boggy land were dry, which helped make my walks more enjoyable. I still managed to go shin-deep into a small bog near to South Uist's highest point when I wasn't paying enough attention, and cycle into one on the Isle of Lewis (there had been a bit of rain by that point). I sort-of enjoyed the bike crash as it was a soft landing and an amazing location for it. Day 2 of Walk 37: Hecla, Beinn Mhòr and South Uist's wild east coast - a good mix of terrain, spectacular views in every direction, and a nice challenge early on in my trip. Also the first time I used a walking pole (after almost leaving it at Uisinis Bothy - luckily I was only 10-minutes away when I realised), and my knees were thankful. Walk 39: Around the Udal Peninsula, North Uist - beautiful beaches, lots of bird life, complete and utter bliss (of course the weather helped in that sense). Walk 44: Huiseabhal Mhòr, Oireabhal and Huiseabhal Beag, Harris - almost a combination of Walks 37 and 39, with beautiful beaches and excellent mountains with great views. 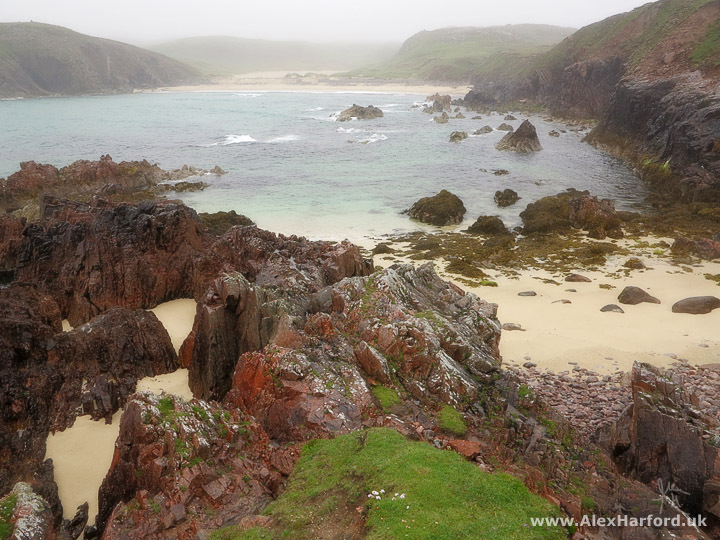 My favourite two walks by far were the two in The Uists; both pretty much how I imagined a perfect day in the Hebrides. The walk I enjoyed most that wasn't in Peter's guide looked interesting when I opened my OS map after arriving by ferry at Leverburgh in Harris - beaches galore from Northton to Rubha an Teampaill (beaches on the way pictured below). 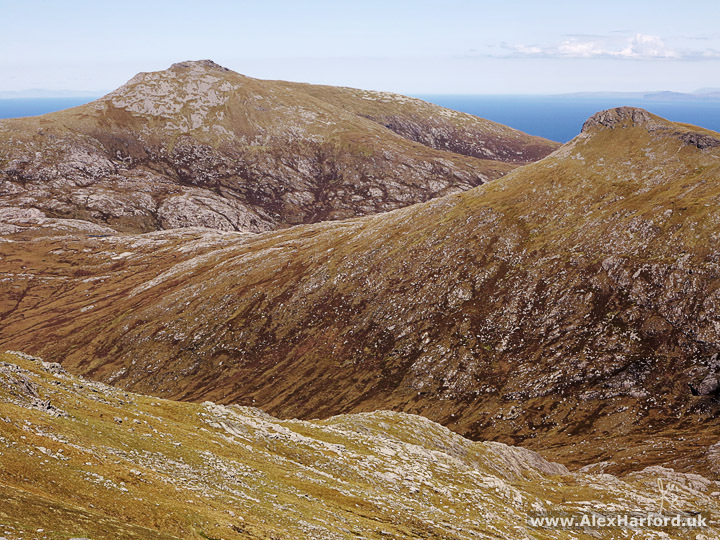 And up to Ceapabhal's summit for a view over them all, with more mountains, beaches and islands in every other direction - including the St Kilda archipelago, the remotest part of the British Isles. 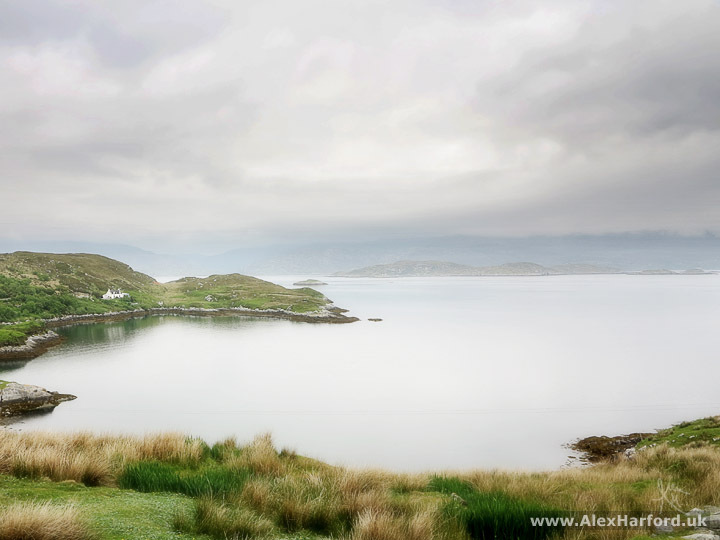 "The Uig Hills and coast of southwest Lewis are my highlight of the Outer Hebrides. These are wild and rugged hills with astonishing views and the coastline at the southern extremity of the peninsula has a magnificently remote atmosphere." So we both share the Uig Hills as a highlight. I was in some of these hills and I agree they feel like the middle of nowhere. Some of the coastline Peter mentions is pictured below. Just to be serious for a moment and help anyone on their way to the Outer Hebrides; there were a couple of days when I wouldn't have liked to be up in the hills and mountains. I used a combination of www.xcweather.co.uk (recommended by numerous locals, and much more accurate than the MET Office/BBC based on my experience) and www.mwis.org.uk to make decisions based on the weather. Another "walker's paradise" thing I've just remembered (though it depends on your point-of-view whether it's a good thing) - there was hardly a sign of a path for many of my walks. It scared me a bit before I went but I actually loved the freedom of wandering wherever I felt like, and found it easier to navigate in a way - as I concentrated on aiming for landmarks and looked at maps in more detail, rather than relying more on a worn track. I always use OS maps. It didn't take much time in the Outer Hebrides to conclude that ridiculously beautiful beaches should be copyright Scotland. 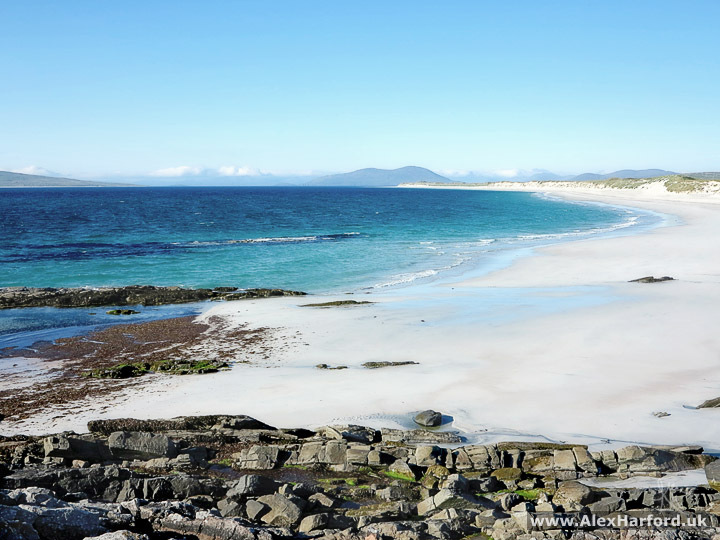 This is still outdoors, but an excuse to show more photos of Outer Hebridean beaches. Many are accessible without strenuous hiking. Here are some favourite photos I've quickly chosen. There are tens (maybe hundreds?) that are just as beautiful. 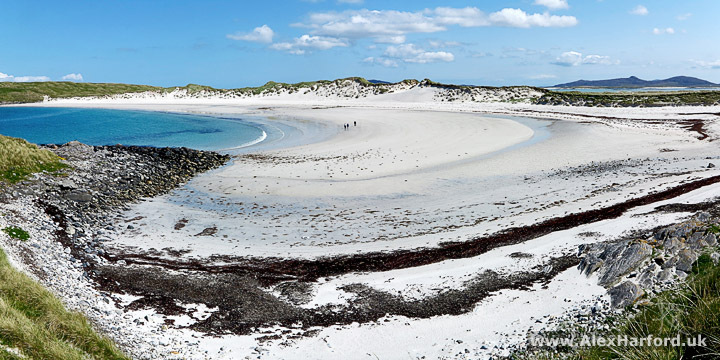 It's impossible to pick a favourite beach, but for the sheer number of beautiful beaches in a small location, I absolutely loved the Udal Peninsula on North Uist, and the area around Mangersta, Carnish and Timsgarry in southwest Lewis. The galleries on the Outer Hebrides were inspirational. 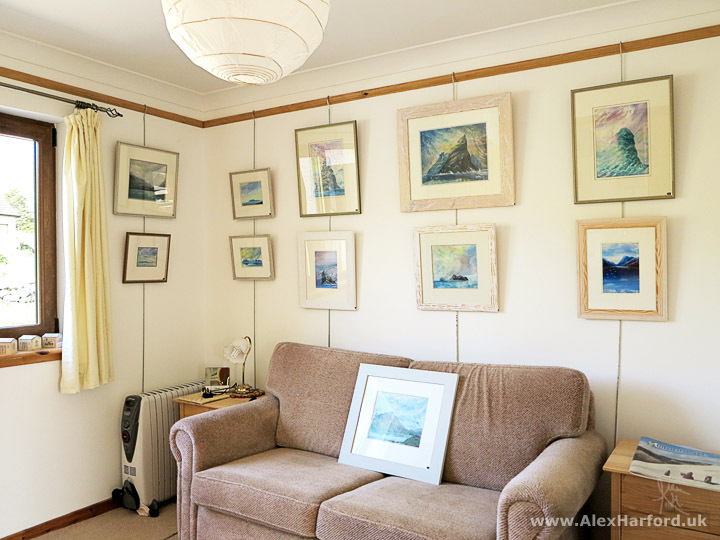 Some are in cafés or specific gallery buildings, but often artists open up a room of their home for people to visit. It's not something I knew about before my trip, and it's now something I'd love to do myself one day. There's sculpture, photography, weaving, craft, painting and probably many other art-forms I've missed. This gallery gave a good impression before I got there. There aren't many trees in the Outer Hebrides, but there are hundreds here (Willie planted them himself) and the "Engage 1st gear, then turn left" sign was useful - I remember thinking "yeah, whatever", but paid attention to the sign anyway and was glad I did, for the short but very steep hill. I've always appreciated various art forms but have never had much knowledge about the history of famous artists. One painter that stood out when I was a child (who still does) was Turner. I love the atmosphere in some of his paintings - there are some amazing skies and seascapes. When I saw Willie Fulton's paintings on the gallery wall I was blown away by the incredible beauty and atmosphere, and thought of Turner. Photography has become my visual medium, but these paintings do things I've never seen a photograph do. I may be talking rubbish, but maybe one of the reasons I was moved by Willie's paintings was because they bridge the gap between a Turner and a photograph. Turner's paintings usually look like a painting however you view them, but there's more reality to Willie's paintings. I felt I could be there, taking in the view, the feelings and atmosphere myself. As well as the stunning land and seascapes, there are the best paintings of sheep I've seen, managing to look endearing and slightly sinister at the same time. Moira Fulton's paintings are a great contrast too - often focusing on the brighter side of life on the Outer Hebrides, and both artists combine to make a must-visit gallery. Inside Willie and Moira Fulton's gallery - my favourite paintings were on the opposite wall, but this is the better photo! 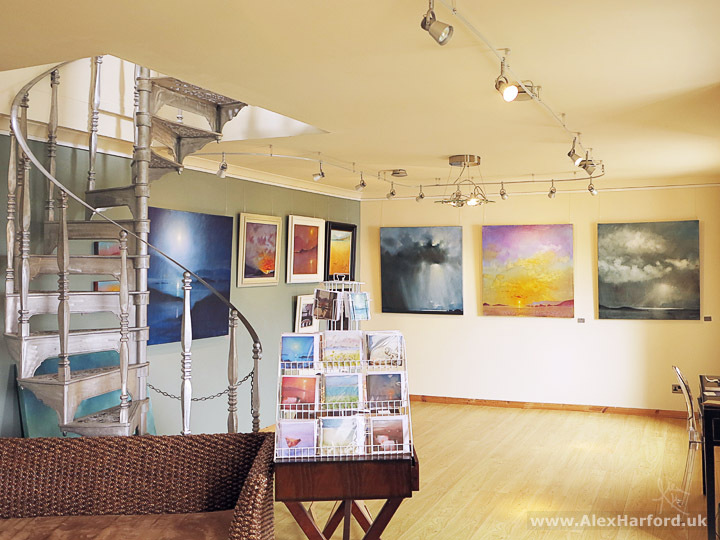 The gallery in Drinishader is also a lovely space, and it was great to chat to both artists. Willie actually built the road to the building himself (I wonder if he gets fed up of telling visitors the same thing over and again?). As for Willie's highlight of the Outer Hebrides: "After 40 years living and painting on the Isle of Harris I'm beginning to understand some of the mystery and spirituality of this very special place." When I first arrived at Brian's gallery, he wasn't around. 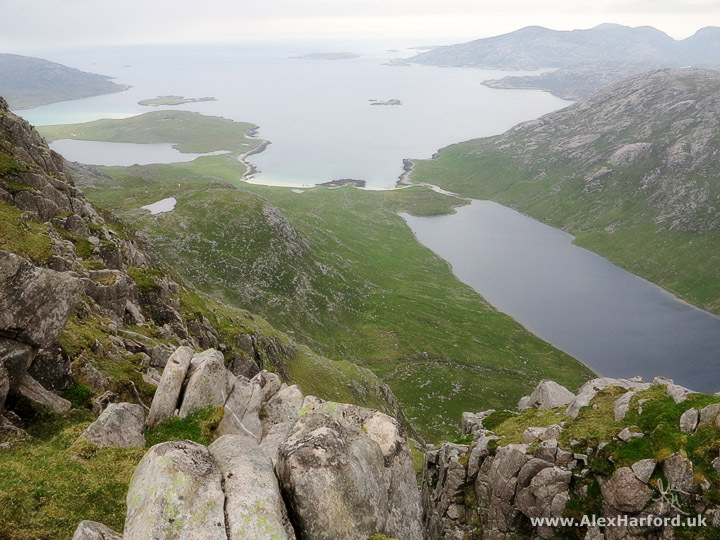 So I returned after climbing the nearby An Cliseam, the highest Outer Hebridean mountain (799m). He still wasn't around, but luckily a neighbour spotted me and let me in. It was more than worth the return visit. Brian paints with beeswax, and if that sounds like a gimmick, it certainly isn't. Brian originally tried beeswax painting as a break from his commercial work, and whether the medium is beeswax or not, the paintings are beautiful in their own right. But the colours he uses, and the different textures he creates with his strokes, are wonderful. He also writes on his website that painting with beeswax "is one of the earliest forms of graphic art known to man. Developed by the ancient Hellenistic Greeks more than 2,000 years ago and soon practised by the Romans and Egyptians." Some layers are partly transparent, and the beeswax has a character all of it's own I can't really describe. I wish I was at the gallery now so I could try to better put it into words. The originals have to be seen to be fully appreciated (as is the case with most paintings, but even more so here). The technique Brian uses is called impasto. "I lay wax glazes by using hot palette knives, irons, soldering irons and any other implements that can be heated up, to give various textures and effects. Hot air guns are then used to burn-in the final rendering." Brian's highlight of living in the Outer Hebrides? He loves the ancient landscapes (that also explains why I saw so many geologists here): "It's contours and designs and textures. The hills are sculptures - the lakes, rivers (and now roads) draw up unique patterns mapping out fascinating landscapes." Both Brian Melton and Willie Fulton (I'm not sure about Moira) moved to the Outer Hebrides from the UK mainland. After only 2 months there, I see the appeal from both their perspectives. There are many places worth visiting I haven't mentioned below, including Shawbost Norse mill and kiln (Lewis), Barpa Langass chambered cairn (North Uist) and the nearly 5,000-year-old famous Callanish standing stones (Lewis), which I happened to be at on Summer Solstice without realising. "Is it always this busy?" I thought. The short boat trip to Kisimul Castle (Barra) is good fun too. Blackhouses are a traditional house that were common across the Hebrides. People and animals (such as cows) shared the same building (separate ends, with a partition between), helping keep them both warm in winter. The last living blackhouse village in the Outer Hebrides was Gearrannan, which after a decline lasting around 70 years, was finally abandoned in 1974. Due to the nature of the materials used (wooden timbered roof covered with turf) and the savage Hebridean weather at certain times of the year, the houses quickly fell into disrepair. Luckily their importance was realised, and they were declared a conservation area two years after the last residents left. Eventually The Gearrannan Trust was set up to restore the village and help preserve the centuries-old way of life that almost disappeared. There are various explanations of where the name "blackhouse" came from. The one I saw most often is that in the late-19th century, houses began to be built with new lime-mortared walls, and as they were much lighter in colour than the existing houses, they became known as "white houses", whereas the old houses became "blackhouses" from that point. I can't remember where, but one definition I read stated they were called blackhouses due to the black coating on the inside from the constant burning of the peat fire. 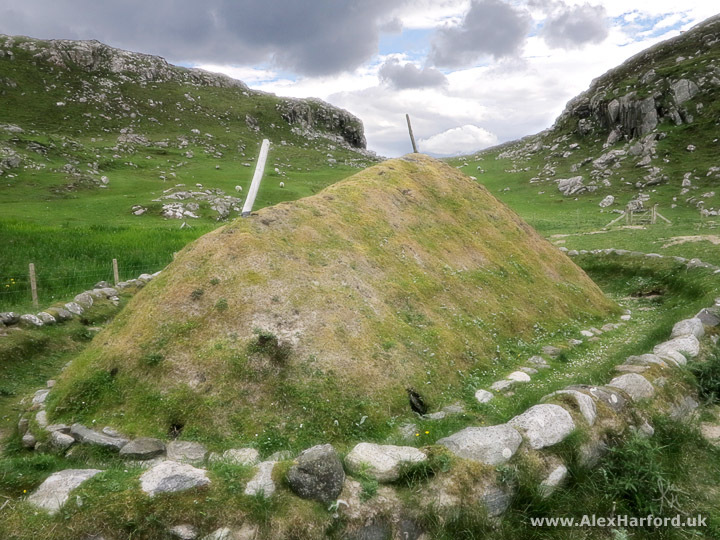 There are many examples across the Hebrides where the blackhouse ruin stands next to the newer white house. If I remember rightly, the exterior difference was the reason given at Gearrannan and the Arnol Blackhouse, so you can't get more authoritative than that. One thing I loved about the Gearrannan Blackhouse Village is that there are no labels, signs or fences in the rooms or unlikely places, making the whole feeling more authentic. It helps for photos too. The information is saved for a separate building. It felt like stepping back in time, and there was even a Harris Tweed weaver in one room. Weaving (at home) and fishing were two of the most popular occupations during the time of the blackhouses. Since 1993, Harris Tweed has been protected by the Harris Tweed Act. 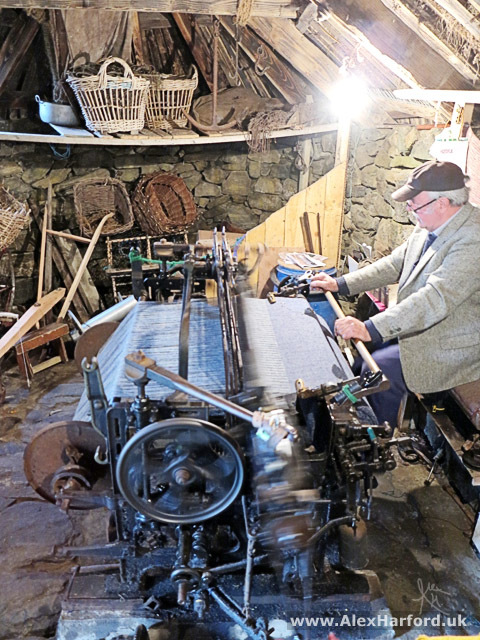 One condition is the tweed must be woven by islanders at their home in the Outer Hebrides. 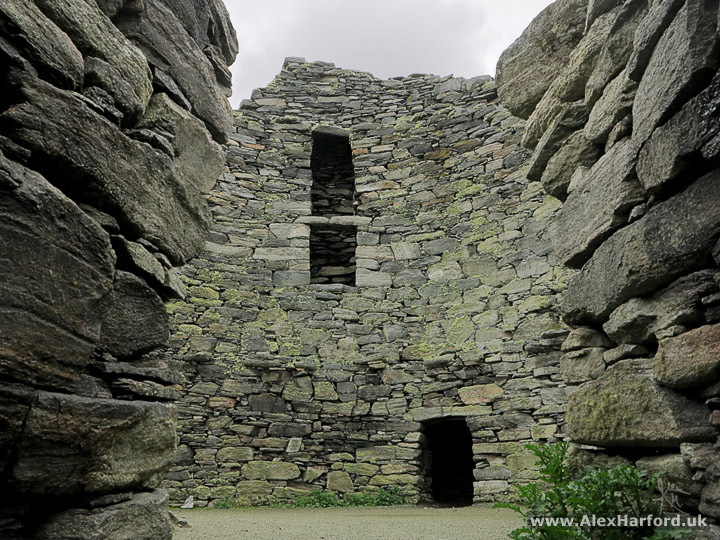 Around 2,000 years old, Dun Carloway broch didn't look like much from the pictures I'd seen, but appearances can be deceptive. I enjoyed clambering and ducking around the structure, and squeezing between it's narrow walls. "Dun" is a word meaning fort, and so is "broch" - "a circular stone tower built around the beginning of the Christian era, having an inner and an outer wall" according to dictionary.com, and unique to Scotland. Despite these definitions, many archaeologists disagree they were intended to be purely defensive. The Historic Scotland information panel at the broch itself says "Probably built to reflect the prestige and status of their inhabitants, brochs were primarily dwelling-places for the principal family in the area. They would have provided some protection against sporadic raiding, but were not purely defensive structures." 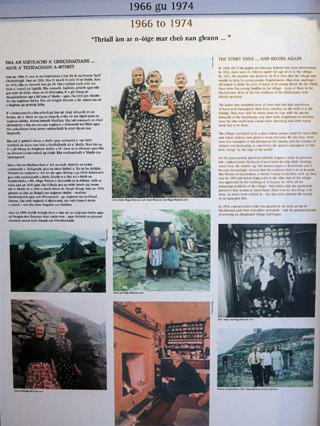 There is a great little museum about the history of brochs and the area, which I wasn't aware of before my visit. This reconstructed Iron Age building is in an incredible location by the coast, with a nice bit of symmetry provided by the beach and neighbouring cemetery when viewed from the hill behind. In 1993, a huge winter storm uncovered a few Iron Age buildings, some almost completely intact. After excavation, they're now covered in sand again, but a reconstruction was built in a safer location. The inside of the building was atmospheric and the local volunteer was brilliantly informative. I love how she does her own experiments to figure out what life was like in one of the houses. 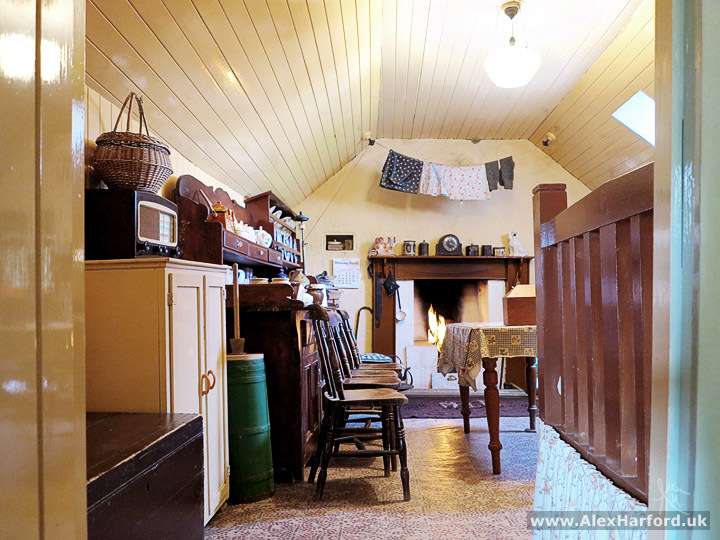 For example, figuring out the best place for the fire (for warmth and drawing the smoke through the chimney) and the warmest place to sit in the building. I was surprised when I asked if she'd been interested in the Iron Age before the building was uncovered, that she hadn't, so she's built up a great knowledge and passion for the era since. If you're on your way here, check the opening times, as it's closed on Sunday and was only open from 12-4pm during my visit. I knew I'd see lots of Outer Hebridean wildlife. I usually use a compact camera with a small zoom, so before the trip I bought a superzoom camera especially for the wildlife. And it's good to have a spare camera for such a long trip - I almost drove over my main camera, and it just about survived. Before I went to the Hebrides, I didn't know the difference between a seagull, kittiwake or fulmar. I probably assumed they were all gulls of varying sizes (the fulmar isn't - it's related to the albatross). 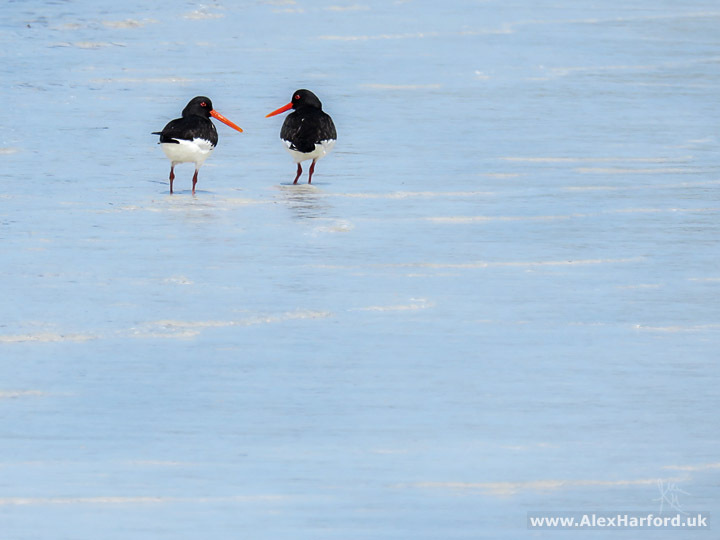 I like to know what I'm taking photos of, so I started by Googling the ubiquitous "black and white bird long orange beak hebrides" to find the oystercatcher, which I felt like I should've known given the long, thin beak. I learnt other birds as I went along, mostly from people I met along the way. Juvenile peregrine falcon, Lewis. 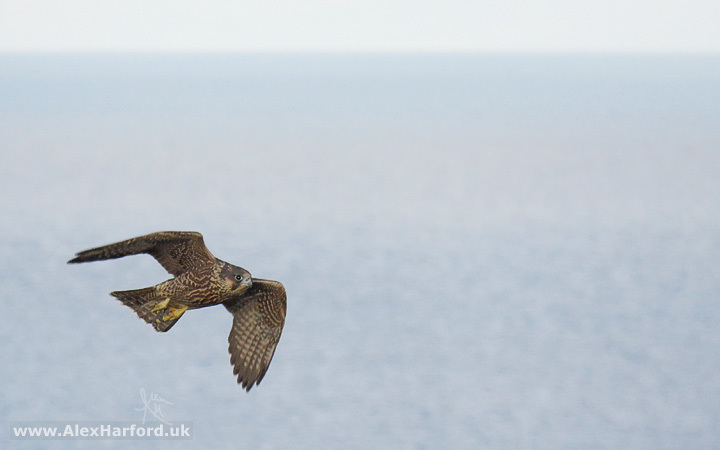 This was 5 metres away from me on a cliff edge - we were as shocked as each other and it flew off straight away, to be joined by another peregrine falcon Oystercatchers on the Isle of Scalpay. I stood and waited around 1/2 an hour to get this shot (patient for me when it comes to photography). 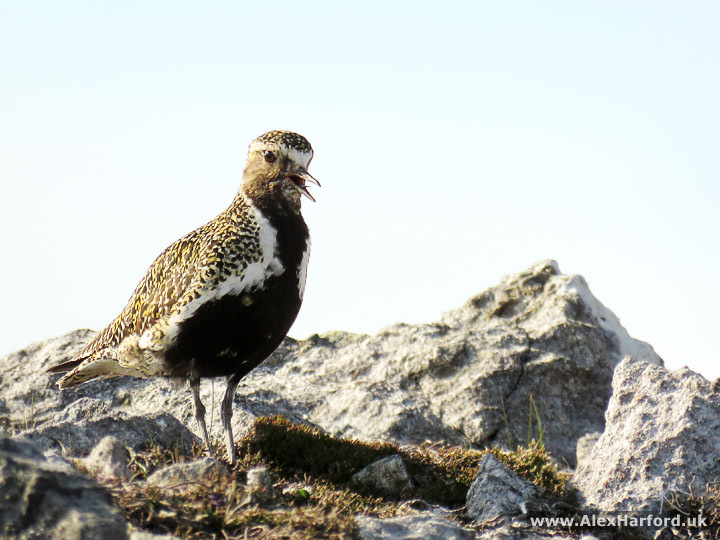 The oystercatchers kept flying to the rock, so I focused on it and waited Golden plover in summer plumage near to Roineabhal summit, Harris. 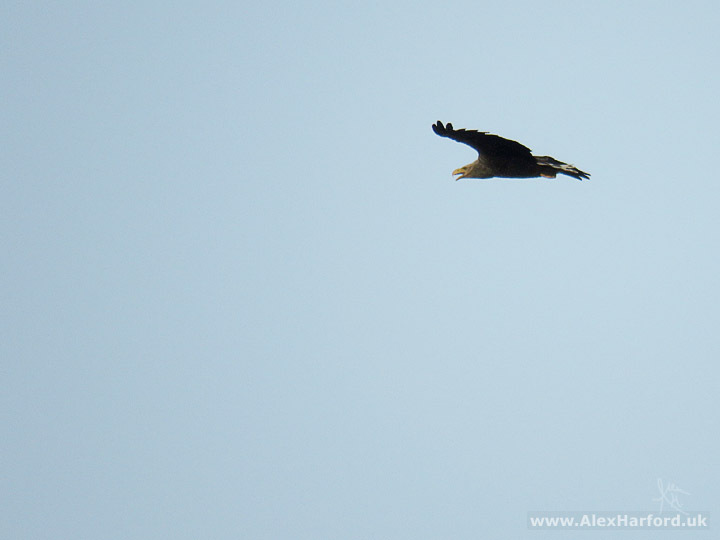 Sea (AKA white-tailed) eagle, South Uist. 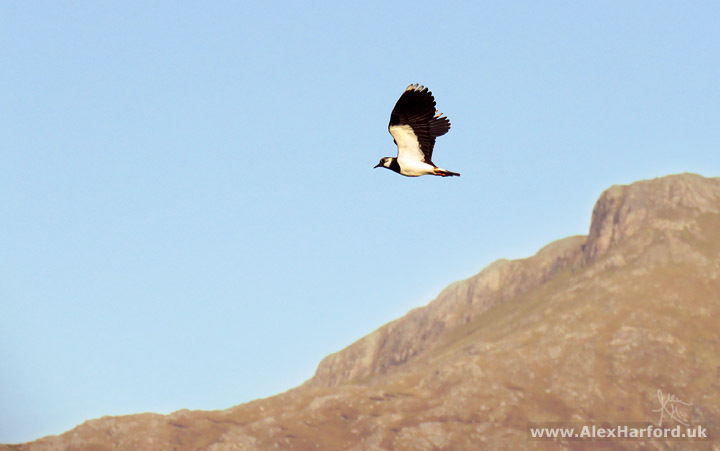 There were at least 3 (I couldn't tell if the fourth was a sea eagle) flying around - it was amazing to watch them for at least 20 minutes until they disappeared further out to sea Lapwing, with Beinn Corradail in the background, Isle of South Uist. So quite conveniently, my favourite walks were in The Uists, my favourite galleries Harris, favourite other tourist things (i.e. 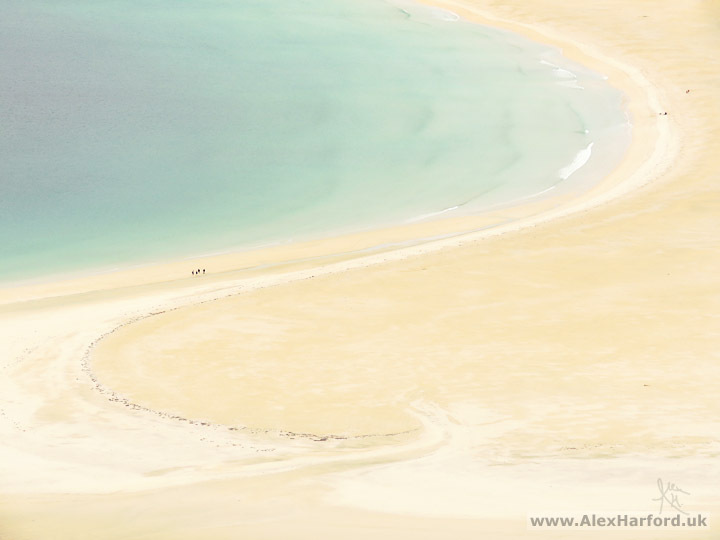 buildings) Lewis, and favourite wildlife and beaches everywhere! It was easily the longest continuous trip I've taken, and I think one of the keys to enjoying it so much was the variation. If I'd walked every day, for example, it probably would have lost it's charm a bit. It was great to be able to mix things up. Even sitting on a beach for an afternoon or evening made a nice change, as I'm not usually a beach holiday kind of person! 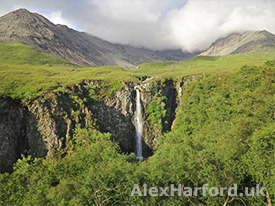 It'd be great if you shared this (I lost thousands of shares after migrating from lensbeyond.com to alexharford.uk). Feel free to get in touch if you have any questions I might be able to answer. 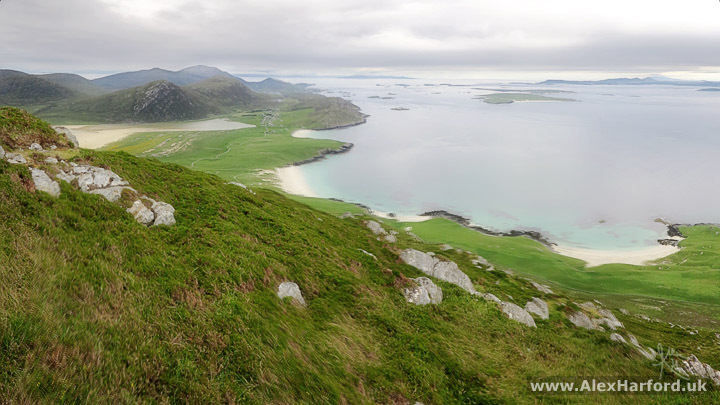 I spent 3 1/2 months travelling around The Hebrides, taking in 21 islands, with a big chunk of that time spent in the Outer Hebrides, where I visited 12 islands from south to north (in order: Barra, Vatersay, Eriskay, South Uist, Benbecula, North Uist, Vallay, Berneray, Harris and Lewis, Scalpay, Great Bernera, Eilean Chaluim Chille).